Freiburg vs Gladbach saw the hosts deliver an impressive home performance with a 3-1 victory over the side from North Rhine-Westphalia. 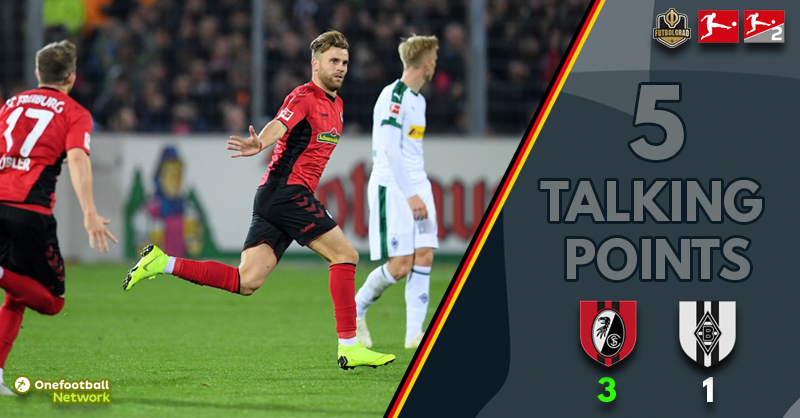 An early Nils Petersen penalty was cancelled out by Thorgan Hazard’s spot kick, with Gian-Luca Waldschmidt and Lucas Höler scoring in the second half to wrap up all three points for Freiburg. 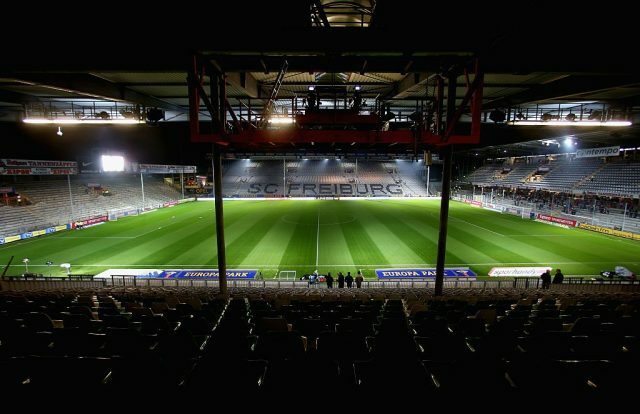 Freiburg lost their opening home game of the season – a two-nil defeat against Eintracht Frankfurt, but are unbeaten at the Schwarzwald-Stadion since then with two draws and two wins. Christian Streich’s men often do their best work in the Black Forest and tonight was no different, deserved victors against a Gladbach side who had been flying in recent weeks. Last season Freiburg won just one game away from home. Many including this scribe predicted a relegation battle this season, but if they keep producing performances like this in front of their home fans they will survive comfortably. There were a number of strong performances for Freiburg with Lukas Kübler and Janik Haberer at the forefront, but special mention must go to Gian-Luca Waldschmidt. The 22-year-old showed the energy and enthusiasm we have come to expect – after winning the early penalty, he then struck a wonderful goal that put Freiburg two-one up. Waldschmidt has played the full 90 minutes in back-to-back games and was a deserved man of the match. He ran the channels, did the dirty work and linked up effectively with Nils Petersen which could be Streich’s go-to strike partnership for the foreseeable future. Book your trip to the majestic Black Forest now by visiting Nickes! The Eintracht Frankfurt junior found playing time hard to come by at Hamburg and it appeared just as elusive after moving south last summer. Freiburg paid a decent fee of €5 million and are starting to see some return on their investment. 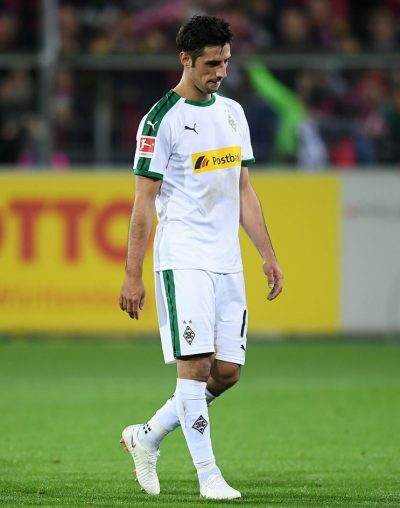 I mentioned last week how influential Lars Stindl is to Borussia Mönchengladbach, particularly since he returned from injury in the three-nil win at Bayern Munich and four-nil win against Mainz. Christian Streich and his coaching staff studied the tape and devised a way to minimise his impact which was simple yet effective. Stindl operates between the lines which were condensed by Freiburg, particularly central midfielders Robin Koch and Nicolas Höfler. Almost every time Stindl dropped deep to pick up the ball he was closed down, and by the time he recovered was unable to provide any threat up front. Dieter Hecking has been rightly praised for Gladbach’s great start to the season and the exciting attacking play delivered on a regular basis. However, he was second best tonight and could do nothing from the bench to change the pattern of the game. Alassane Pléa was virtually anonymous in the first half and was hooked at the break for Patrick Herrmann who didn’t fare much better. After falling behind two-one, Hecking brought on Florian Neuhaus for Tobias Strobl with Denis Zakaria moving into the holding role, but Neuhaus had minimal impact. Hecking’s last throw of the dice was to sacrifice Michael Lang for Ibrahima Traoré, but once again it made no difference as Freiburg held firm and hit the visitors with a late sucker punch to deliver the knockout blow. Making man for man substitutions simply didn’t work, what was required was something more substantial to break down a stubborn and well drilled Freiburg side. Christian Streich was the winner in the managerial battle, Hecking needs to learn from this match because most of their upcoming opponents are likely to use similar tactics. Freiburg has been an unhappy venue for Borussia Mönchengladbach and so it continued. In 17 Bundesliga encounters between these clubs in the Black Forest, Freiburg have now won 11 with five draws and just one defeat. After an exceptional result on Matchday Eight against Mainz, tonight’s result could see Gladbach fall from second down to sixth – if results go against them on Saturday and Sunday. Die Fohlen will have to hope that the teams around them struggle as much as they did on Matchday Nine, unless a wonderful victory last time out will have been shattered by their slip at the Schwarzwald-Stadion this evening.